William Rossa Cole (1919-2000) was best known as an editor and anthologist. 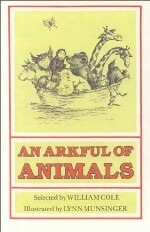 He was editor or author (or co-editor or co-author) of about 75 books, 50 of them anthologies. Three of his books were honored by the American Library Association (ALA): I Went to the Animal Fair in 1958, Beastly Boys and Ghastly Girls in 1964, and The Birds and Beast Were There in 1965. He was an editor for Simon & Schuster and Viking and a columnist for the Saturday Review. He died in summer 2000, at the age of 80. Beastly Boys and Ghastly Girls has achieved a rather cult-like following. For those with siblings, especially. 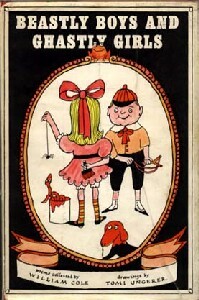 The original edition was illustrated by Tomi Ungerer in 1964; a later edition was illustrated by Shel Silverstein in 1977 (in which "Sarah Cynthia Sylvia Stout" of garbage fame first appeared). Beastly Boys and Ghastly Girls. 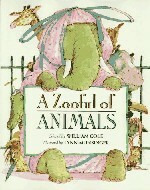 edited by William Cole. Illustrated by Tomi Ungerer. World Publishing, 1964. Illustrated by Shel Silverstein. 1977. Bah! Humbug: Grumping Through the Season. 1992. 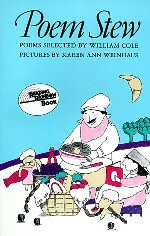 Fireside Book of Humorous Poetry, various illustrators. 1959. Humorous Poetry for Children, illustrated by Ervine Metzl. 1955. I Went to the Animal Fair, illustrated by Colette Rosselli.1958. …also several books of knock-knock jokes, as well as anthologies of poetry and collections of cartoons for adults.